I AM MICHAEL is a provocative screening choice for a festival that celebrates the LGBT community. This is because it doesn't tell a coming out story, but a going in story, based on the true-life case of Michael Glatze. 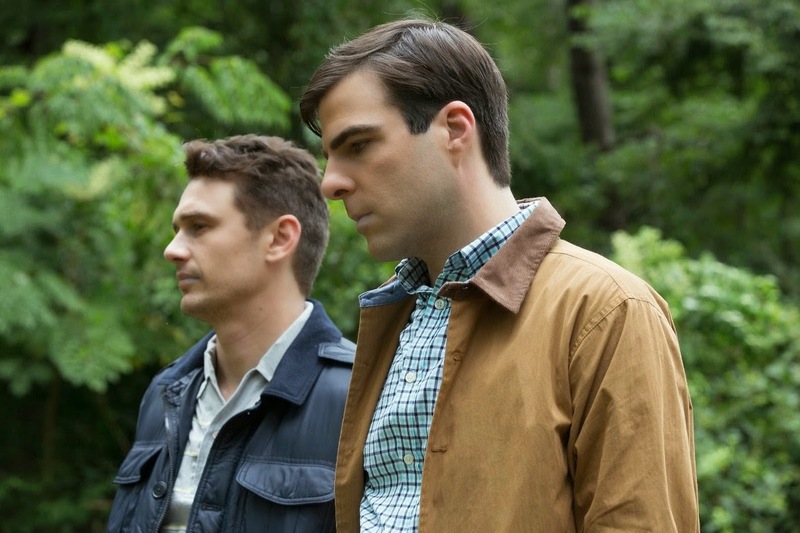 Michael (James Franco) was a seemingly happy gay rights activist and journalist living in San Francisco with his partner Bennett (Zachary Quinto). But something about the death of his mother, his increasing panic attacks, and belief that opening himself up to religion had helped calm him, led him to renounce his homosexuality in order to be reunited with his mother in the afterlife. He trained as a preacher, married a woman he met at bible camp (Emma Roberts) and continues in his new identity to this day. The film that openly gay director Justin Kelly has made of Michael's conversion is admirably even-handed and provocative. We see that Michael is the kind of guy who can't just profess an opinion - he has to persuade others of it - and convert them to his cause. He has a kind of missionary zeal as a gay man, taking it upon himself to rescue the oppressed gay kids of America from the Christian Right, and once he's converted, he has a similar missionary zeal in rescuing gay kids of America from being gay. A lot of what Michael does when he converts is grating - telling his distraught ex-boyfriend that he'll pray for him or that he is abnormal. It's always a challenge to make a film about a protagonist who for many in the audience will seem hard to like. That said, Justin Kelly and James Franco portray Michael with an honesty of purpose. His confusion and questioning - his guilt over his mother's death and need to see her in the afterlife are authentic and demand respect - and while his need to influence other's to take his path is contemptible his final ambiguity is sympathetic. Is he beatifically happy or deeply unhappy? I wonder if the real Michal truly knows. The fact that he would sell his life story to Franco and allow Kelly to make the story suggests he isn't shying away from his gay past or unsympathetic portrayals. Maybe his intellectual and emotional discussion continues and he felt he needed to see an independent depiction of his life on screen to help him figure everything out. Or maybe he sees it as a means to get his message of conversion out? Like all the best films, I AM MICHAEL leaves you with more questions than it answers and prompts a meaningful debate. Franco, Quinto and Roberts are able actors - Quinto especially heart-breaking - and Kelly is both balanced and acutely sensitive to the nuance in Michael/Franco's moods. The only criticism I would make is that the movie suffers from a very slow pace in its early sections. I AM MICHAEL has a running time of 98 minutes and is not yet rated.